There are currently 4,386 users on this website. 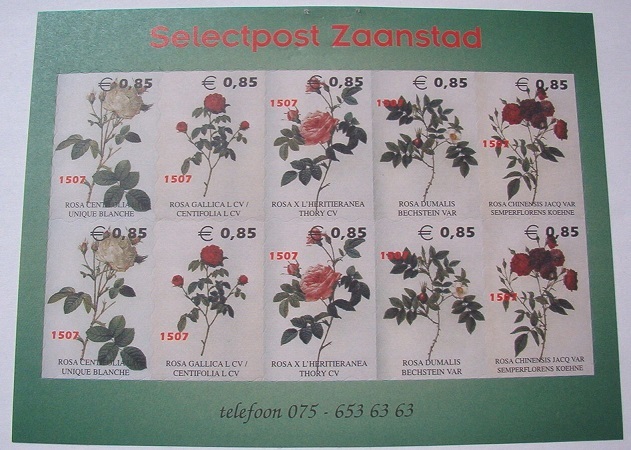 Well, the first one is a Heritage Rose and the question is Spanish or French language. Looks new and modern and has the shape of a lot of new Russian stamps but that is not the Russian language. Perhaps it is a kind of unity statement. The first being French and the second flower being German - stein- and the third being ,,, Italy, perhaps? Maybe there was a sheet. I will keep checking back to see if anyone knows. TY for posting. For those who don't know: "�" stands for "euro" the currency of most of the European Union countries (France, Italy, Belgium, Low Countries, Luxemburg, Germany, Spain, Malta, Cyprus, Greece, Estonia, Finland, Portugal, Slovenia, Latvia, Lithuania...) and some associated countries (Andorra, M�naco, Vatican & San marino). They're from a dutch local private post. It took 0.55 seconds to lick this stamp.